Orange you glad you clicked on this list? 1. They're basically just miniature house tigers. 2. Or, in some cases, not so miniature. 3. There's never a dull moment when they're around. "If there's nip in here, I'll find it"
5. Honestly, you'll never know where you might find them. 6. 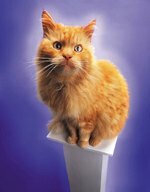 And if you need a traveling companion, orange tabbies can be ready to G-O at a moment's notice. 7. While they are naturally mischievous (because cats, LOL), orange tabbies still love a good cuddle sesh with their people. "Wake me up when it's time for second breakfast"
9. ... and the most expressive eyes. 10. Just don't forget to feed them first thing in the morning, lest you get blasted with a death stare. 11. Because their coats are naturally bright, orange tabbies are super photogenic, so you'll get more "Likes" on all your Insta posts. "How many times do I have to tell ya to set the camera to landscape mode?" 12. See? Just look at this handsome stud. The only place he's going is to the front page of Imgur. "Did someone just crack a can of tuna?" 13. Like most kittens, orange tabbies are also furry little ninjas capable of the most adorable sneak attacks that you'll never see coming. 15. ... and other animals (😉), which means they're purrfect (soz, not soz) for pretty much every type of squad. 16. Once more, but this time for reals. D'awww! 17. Among other talents and superpowers, they always know where the sun is shinning its rays the strongest. "Device will purr will charging is complete"
18. And because they definitely know how to rock the formal wear, they're great companions on the party circuit. "Does this bow tie make my neck look fat?" 19. Don't feel like going out tho? 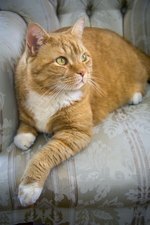 Orange tabbies are content to stay at home and binge your favorite shows. 20. Need help around the house? They probably won't lift a paw but they are happy to supervise. 21. In conclusion: Orange tabby cats > All other tabby cats (don't @ me, you're argument is invalid).